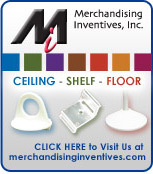 POP Superstore - Ceiling, Shelf and Floor Merchandising Solutions and products for Retail and Commercial use. Welcome to the POP Superstore. Your one stop online shop for all your point of purchase needs for retail or small business without any bulk purchase requirements. P.O.P. Superstore is a branch of Merchandising Inventives, known throughout the point of purchase industry as one of the original innovators and inventors of the retail point of purchase marketplace with over 60 years of experience in customer satisfaction and innovation in the fields of advertising. Inside this website, you'll find all the same great products you need for your merchandising requirements that are usually only available in bulk quantities from other merchandising companies. P.O.P. Superstore carries a wide variety of point-of-purchase products for your ceiling, shelf and floor display requirements at discount prices in smaller quantities. Let P.O.P. Superstore be your one-stop-shop-for-P.O.P.! Feel free to browse our site and look for the products you need. If you don't see what you're looking for, drop us a line and tell us what you need, chances are if we don't have it we know another point of purchase retailer that does! Use this quick reference guide to find the products you need Fast!